Sometimes life gets so busy, we change, things change us. Sometimes directions in life are easy, sometimes a little harder. We all set ourselves goals, day by day, week by week…month by month…and even next year. Every week I set myself some weekly goals to visit my circle of friends. Those whose blogs I adore to look at, read, comment and get inspired from. Our circles of friends are all different. We all have different passions. Those who write poems, who create in their kitchens, who paint, who make tea, who capture things through the lens…and you my friend, are part of my circle, and how lonely my life would be without you. 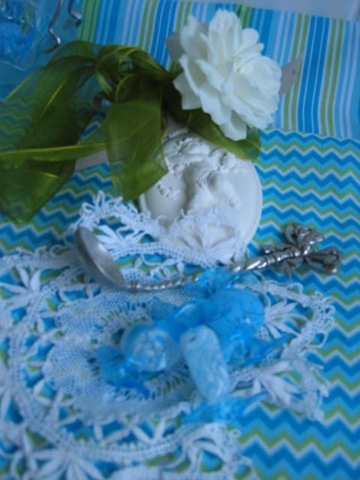 Today, I wanted to share with you, a reflective corner of blue and white. The changing blue skies and those soft romantic white clouds, are finally appearing and reflecting a new Spring/ Summer . 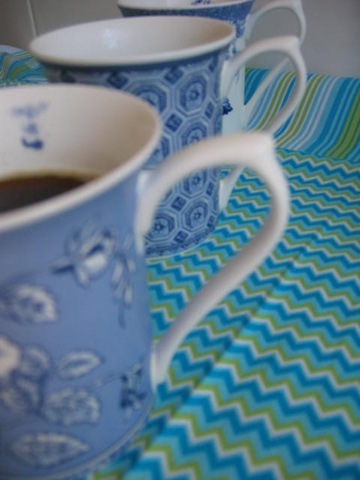 Blue and White china mugs…can’t you smell the aroma of freshly brewed coffee! 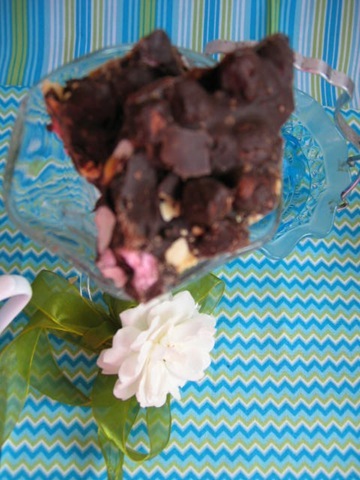 Served with a handsome favourite of Rocky Road. 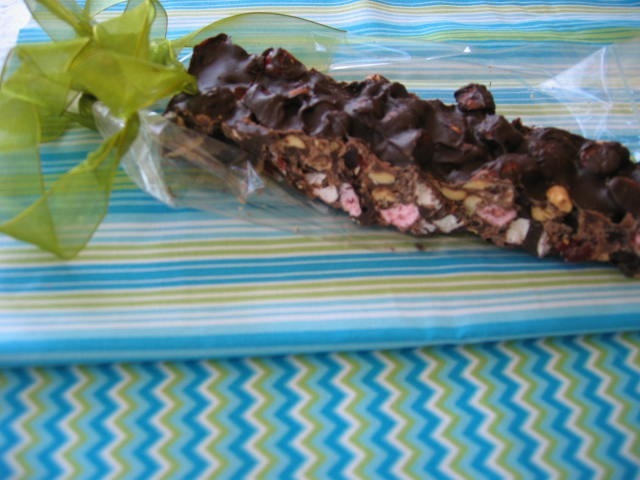 Chocolate, nuts, cherries and marshmallows…Ohhh! what temptation! I got lost for a while a few hours in the material department, don’t you just love the new textured fabrics I purchased. Fun new colours and designs, enhancing my styling photography. Venetian glass, beautifully hand crafted Murano glass candy. 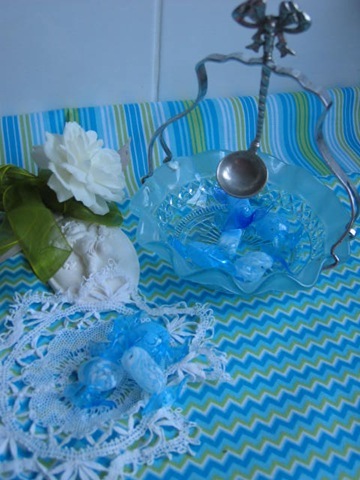 A very antique blue cut glassware sugar bowl. The original spoon lost, but this beautiful silver bowed round spoon sits in place lovely. 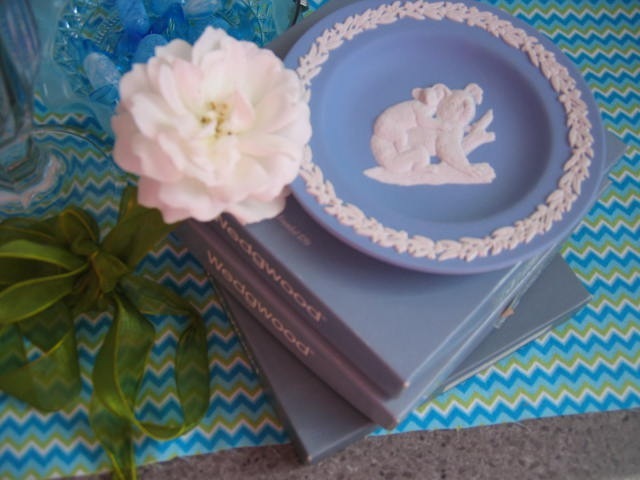 The first tableware I would think of in blue and white, would be the ultimate’s in tableware..Wedgewood. Magnificent masterpieces of elegant ceramics.A vision of perfection…stunning designs, with delicate edges that resemble linens and lace. This Wedgewood leaf plate is called ‘Ice Rose’, an intricate rose design with a single gold stem and leaves. 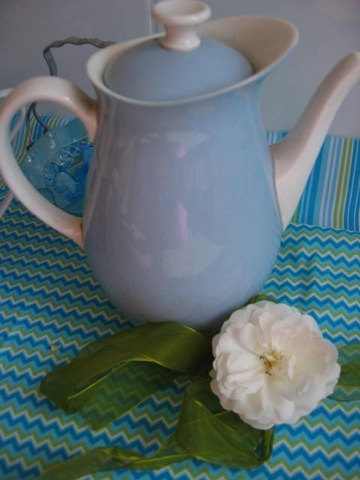 A Wedgewood blue and white teapot. 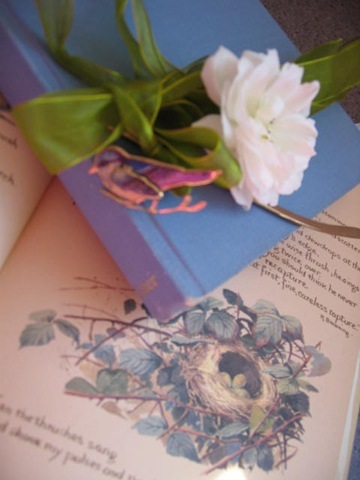 And Springs images..blue bird bookmark. Thanks for stopping by and sharing in some blue and white with me. I must be there with you as there is a cup of black coffee! …you’re welcome, can’t resist a strong espresso! Beautiful “Blue” post! Your tea mugs are very pretty in blue and white! Thank you for sharing so many of your lovely treasures with us all. Thanks for being part of the circle, a few touches of blue dotted amongst more white things in my life. Lovely post. I do like blue and white. Your mugs are wonderful as is the Wedgewood tea pot. Wonderful treasures. Happy Tea Day! 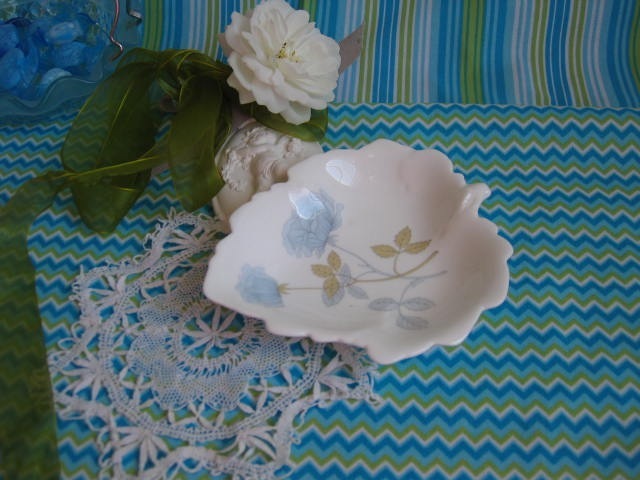 Wedgewood is so elegant in its blue and white, and those mugs are our regular every day tea or coffee mugs, thanks for joining my circle today. 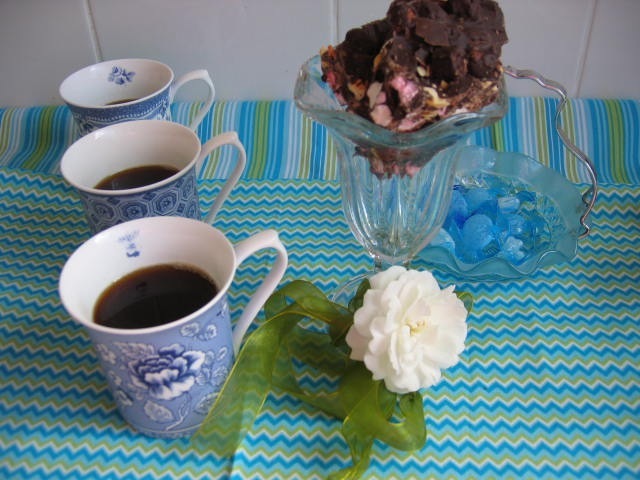 Oh that looks lovely Yvette, I wish I could sit down for a coffee visit with you! 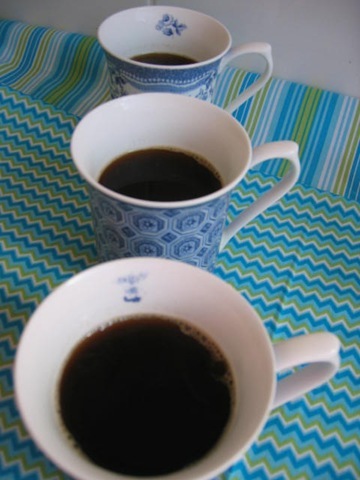 Cindy, you’re always welcome to the circle, and we”re all so busy sometimes it would be great just to ‘sit’ for coffee with friends..
What a beautiful post Yvette and I love your blue and white mugs! Have a happy day and thanks for sharing your treasures with us. Well, I simply cannot start my day without coffee. Your cups are very pretty! 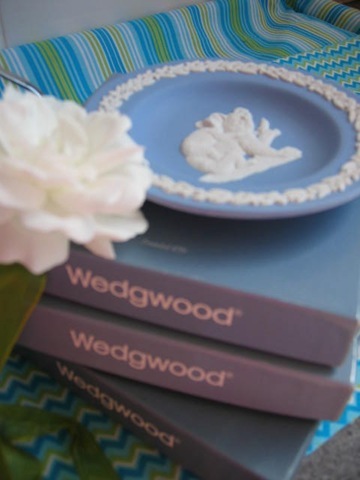 I love Wedgwood too and used to sell it years ago in the jewelery store. Lovely post and thank you for sharing it with us. Enjoy this day. This just so refreshingly lovely.., I love each and every detail and especially the artfully arranged vignettes with the white flower, green ribbon and blue and white tea mug on the fabrics.., Fabulous! Many thanks for joining me for the celebration of my 100th, Tuesday Tea For Two’, as well as for our 71st, ‘Teapot And Tea Things Tuesday’. Two’. 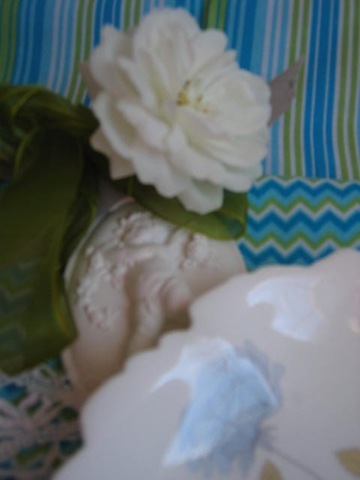 So nice to meet you and I just loved your tea with the gorgeous blue and white, one of my favorites. The details make this so special and refreshing. Perfect for whatever season you are in. Ours nearing Fall. Beautiful words so fitting for our blogland circle of friends. Thank you for sharing your heart and gorgeous tea day. Thank you for stopping by for tea with me also, and for your kind words. It is great to have friends, their presence in our lives is precious! What a lovely post and beautiful photos. Bought back happy memories of going on a school trip as a child to the Wedgewood factory and being allowed to press out little moulds of the cameos which we took home to our mothers (a bit crumbled by then, but we were terribly proud children!). Thanks for your visit on Tea Day. Hello, Yvette…I can tell spring is stretching her lovely sleepy arms on your side of the world. Your blues are echoing the pretty skies. I do like your Wedgwood teapot…very pretty colors and soft glaze shine. Oh, and yes, I love the smell of freshly brewed coffee. I wish I could still drink it. But alas, a cumulative amount makes my body feel achy and tired like I am coming down with the flu (this happened after menopause) – so I stick to tea now. But an occasional cup is a joy. I am just loving your blues! They are so lively and do remind me of the sky and of the sea! Gorgeous teacups and teapot! Your fabric choices are quite inspiring! Love your coffee shots ~ yum! 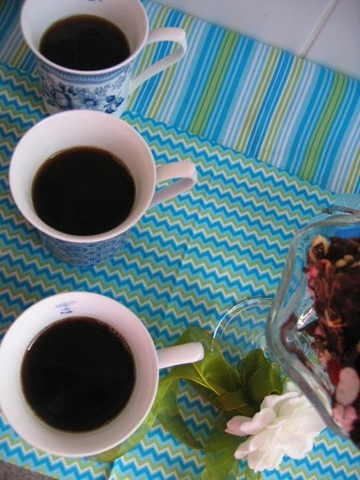 A cup is even better sipped with a friend!